Emotional Architecture on Pelican Playgrounds, August 2018. Image: Angélica Teuta. 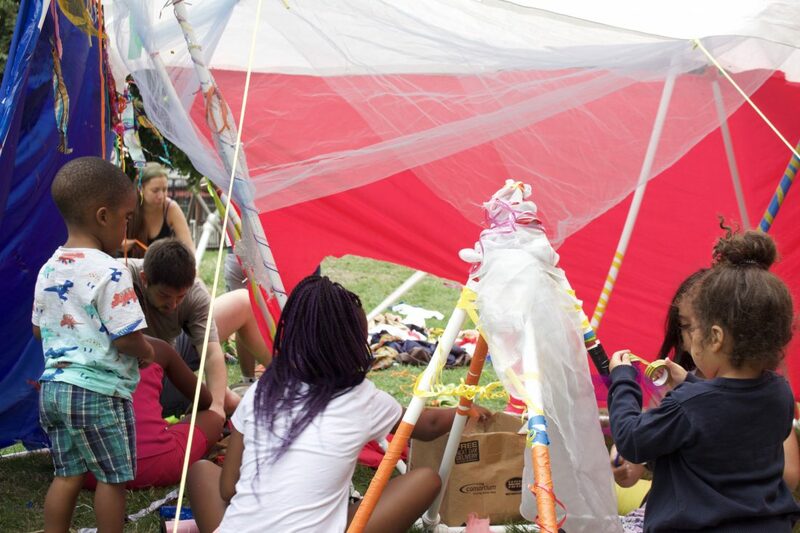 This August Colombian artist Angélica Teuta has been running workshops on Pelican Playground as part of a summer residency co-hosted by Pelican Plus Tenants & Residents’ Association and the South London Gallery. 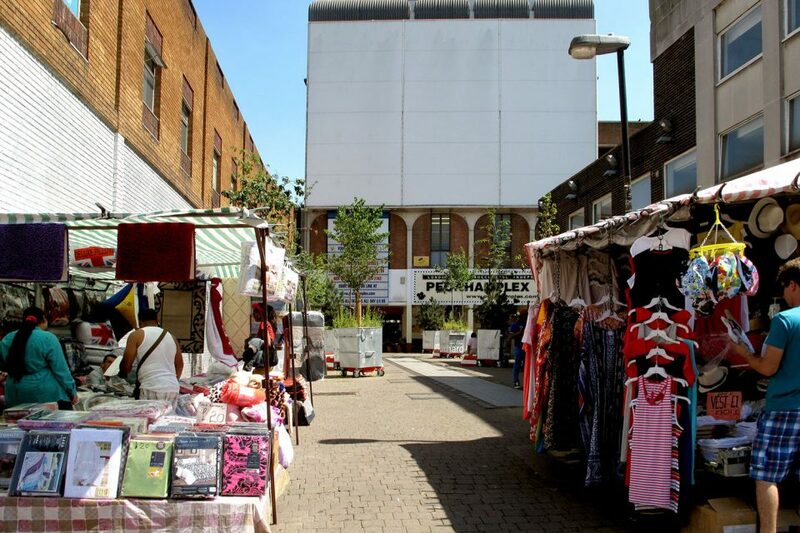 This residency is part of Open Plan, a public art and education project for local residents living on Elmington, Sceaux Gardens and Pelican Estates. Samantha Lippett: Angélica, can you begin by introducing your project ‘Emotional Architecture’ as well as some of the thinking behind its concept and your working process? Angélica Teuta: ‘Emotional Architecture’ began as a thesis project in 2015 when studying my Masters in Visual Arts at Columbia University in New York. The name comes from the Manifiesto de la Arquitectura Emocional (Emotional Architecture Manifesto) written by Mathias Goeritz who was a German artist based in Mexico. He said that, “Art in general, and naturally also architecture, is a reflection of the spiritual state of man in his time”. So, he thought of art and architecture as the same thing. He believed that sculptures are not objects to display in spaces but they also belong to and influence the emotional or spiritual feeling of a space. I believe these ideas were shaped by his experiences of Mexican thinking. For the project, I began to consider how working in these various contexts could influence my practice as a Latin American artist and how it is natural for me to see how emotions influence a space and vice versa. I started by writing my own set of working ‘rules’ to guide my working process in the various contexts I work in. So, while the conditions of work might change, I use these rules to maintain a constant thread in every iteration of ‘Emotional Architecture’. Create a symbiotic play between the host space and the temporary guest-structure. Fabricate environments between fiction and a temporary need of the community, involving animal habitats as examples. Work with basic construction methods learned from DIY books and vernacular knowledge exchange. Use archetypal or recognisable structures for a non-expert public. 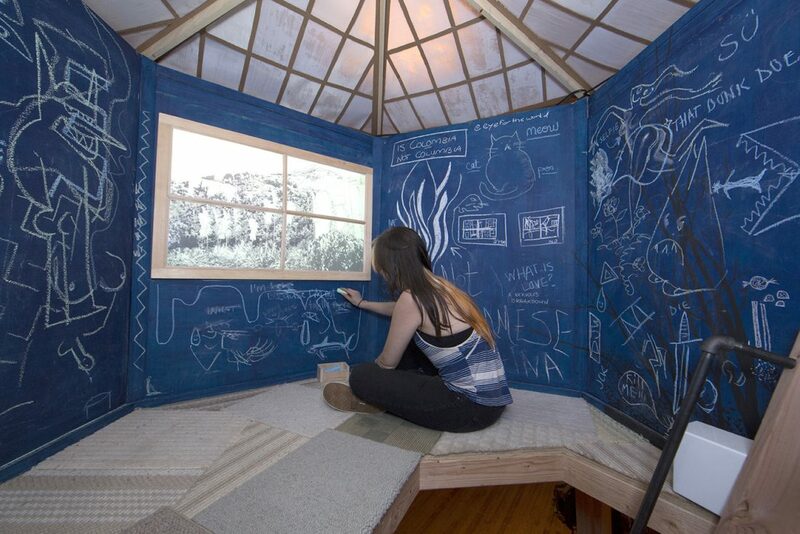 Foster a physical interaction with the visitor and the artwork. Misplace interior design elements into outdoor features and vice versa. AT: So yes, I like to build a structure in response to the need of the community but also including aspects of phantasmagoria. So not only does the structure serve a function, it also taps into the imaginations of the people that will use it. It might initially look like something recognisable but with these added elements, it becomes a hybrid of conventional architecture. I am also trying to appropriate preexisting structures and to misplace the spaces within them. Something like putting outdoor play indoors or when I built three treehouse’s in the Museum of Modern Art in Medellin, for example. So, as a person who is not necessarily into art, you can easily recognise the structure but it is placed into a different context. SL: Yes, you have talked to me about the importance of the domestic qualities in the work or using materials and methods that are instantly recognisable but perhaps you’re not quite sure where they’re familiar from. 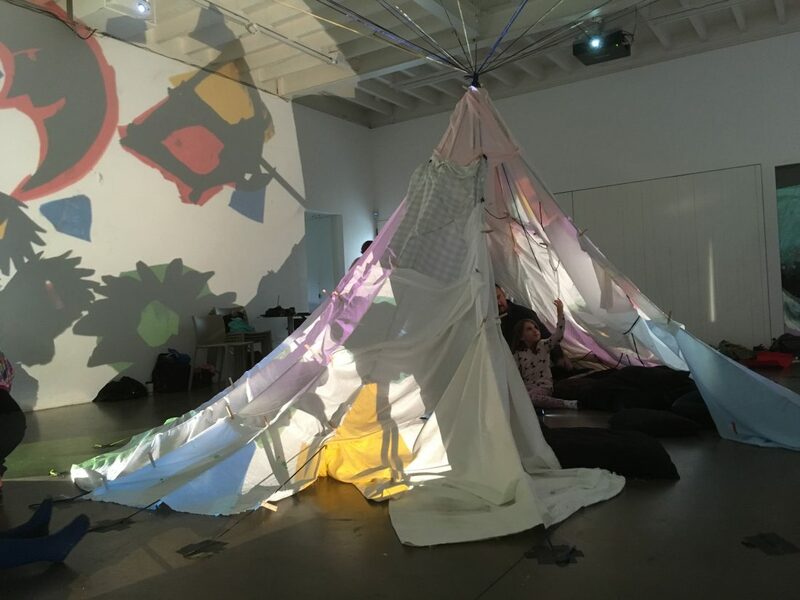 AT: Yes, things like that and in my thesis I write that ‘Emotional Architecture’ always comes with this idea that everybody has a need to make shelter or build something, as we experienced with dens and blanket forts as kids. Always when I am working with the communities in Colombia, I ask what is their shared need. That is always important to me. Such as the workshops we are doing for Sunday Spot and on Pelican Estate, when we finish it has always become a structure that is for everybody. It is not individual units or rooms. In the end, it is something that everyone has worked for and that is really important for the project. SL: Yes, I noticed the importance of collaboration during the Sunday Spot sessions and particularly since many of these children had never met before. This was interesting in the second workshop when small groups were making individual dens and then these structures began to naturally merge into one another and everybody began working together. AT: Exactly and this kind of shared space is another of the values of ‘Emotional Architecture’ and I think that is a very Latin American way to think because when I travel to other places such as the United States or Europe, it seems to be more about peoples individual lives. Like, my laptop, my cup, my room, my place. There is not this sense of openness I am used to. Even in this very coffee shop, you are sharing a space but everybody is plugged into their computers and headphones, alone. This doesn’t happen in Colombia, yet. Yet! I started to work with communities in 2016. The first one was an illegitimate, or ‘pirate’, neighbourhood in Buenaventura city. The story of the area is pretty horrid, so I don’t know if we want to talk about it in depth but it is a very poor community who have no access to basic public services. Their neighbourhood is made of palafito houses that are built on top of the sea because when you build in this way, you are not technically not breaking the law as you are not taking land. I was interested in seeing how these structures are built and how the community could teach me these techniques. However, paramilitary groups took advantage of their remote locations to perform acts of violence including murder. At some point, the community came together and talked to organisations abroad and the Colombian government, deciding to declare this space free of these kinds of acts to remove the violence from the neighbourhood. 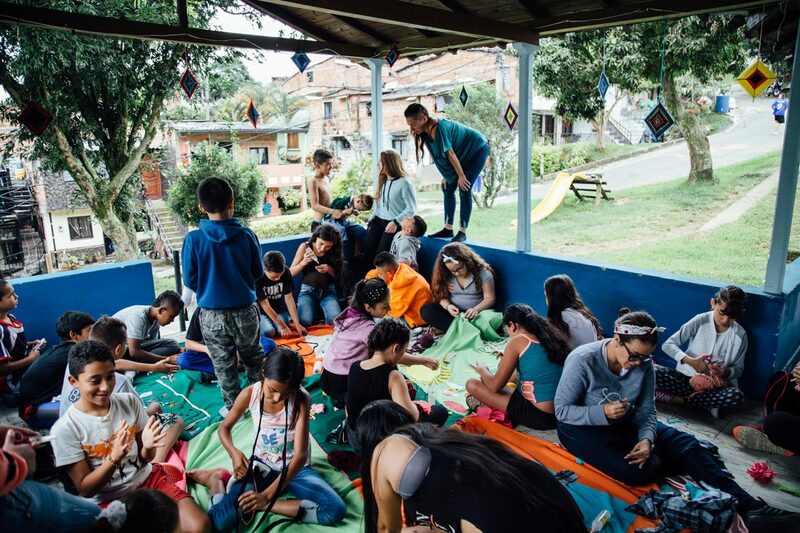 Some organisations followed their ideas and provided security for the community as a holding, so this became the first humanitarian urban space in Colombia. It remains poor but at least due to military protection, there is no longer any violence. So I decided to work with them as I had seen a few previous projects provided by Sueño Pacifico with the leaders of the community. So for example, before my project, kids used to have toy guns and reproduce this same kind of violence through play, so the leaders developed a game where they provided musical instruments in exchange for toy guns. SL: Who were the leaders? AT: I would have to research the specific names but they are basically families in the community who work together to improve the conditions. I found the foundation I worked with on Facebook as they wanted to work with artists. So I contacted them about ‘Emotional Architecture’ and basically said that I wanted to go in to work with the community but that I couldn’t go in by myself. I needed them to go in with me, represent me and tell the community what I wanted to do. They really liked my project as it is all about building and they said that while they had always engaged with mothers and kids, they hadn’t been able to work with male adults but because my project was all about carpentry and working with wood, that it was the best project for males in the community to work with. I usually tell them where I am from so they also understand why it is important for me, as well as why it is important that the kids are involved. So in this case, the conditions of their communal shelter were really bad. It was only being used by fisherman, where they go to drink beer and play dominos. So I decided to go in and after having some beers with them, found out they had a dream to build a cultural centre. They wanted a place where they can drink beer in the first floor and then in the second floor a space for women to hang out and on the third, a place where the kids can make art. So it was really nice to see that they were also thinking about the community but it was just the women and others in the community didn’t know it. SL: It’s interesting how you going in alien to the community they felt they could tell you something they hadn’t been able to communicate to one other. They likely all wanted the same things but there was just this barrier. Did you talk to the others and reveal that they wanted that? AT: Yes, of course and they talked to me because I just sat down one night to drink beer with them. I mean I’m not saying that it was as easy as having a drink! I spent a lot of time going there almost everyday. To put it short, we built a better ‘choza’ (shelter) with the materials I had in that moment and managed to at least set up a structure for them to have better columns to create a second floor in the future. We also painted the whole place with the kids. At the end of the project, we had a gathering where people played dominos and cards together and kids shared their drawings for the project in the future. So I went there not as a saviour but to set up the foundations of something they can continue without me. I was just there to provide some materials and I am pretty sure at some point, someone else will bring more but at least now they are the ones who know how to build. SL: You’ve shared and given them the skills and perhaps as someone new, you injected some kind of positive thinking. Like ‘yes, yes I can do this and yes I can improve my environment’. AT: Have you heard the ‘broken window’ theory? AT: You should definitely check out this theory. I like to think this way when working with these kinds of communities and specifically this one in Buenaventura. It is a criminological theory from the United States. So if you imagine a neighbourhood that is in really bad condition, if you begin to make small changes like the broken windows you will begin to see, socially speaking, how people will start to feel less violent and more positive about their surroundings. SL: I’m really keen to talk about this moment in ‘Emotional Architecture’ when you began to work with the kids, as well as the anxieties that we had when you suggested leaving the structure alone. I know it’s not finished yet but I am talking about the concerns we had leaving it to exist on Pelican estate outside of workshop hours and with the potential of it being damaged. I am also interested in the differences between ‘Emotional Architecture’ existing in a gallery setting and how it exists in community spaces and perhaps after a year of constant activity, having this moment to reflect, how you now feel these experiences have shaped your practice? 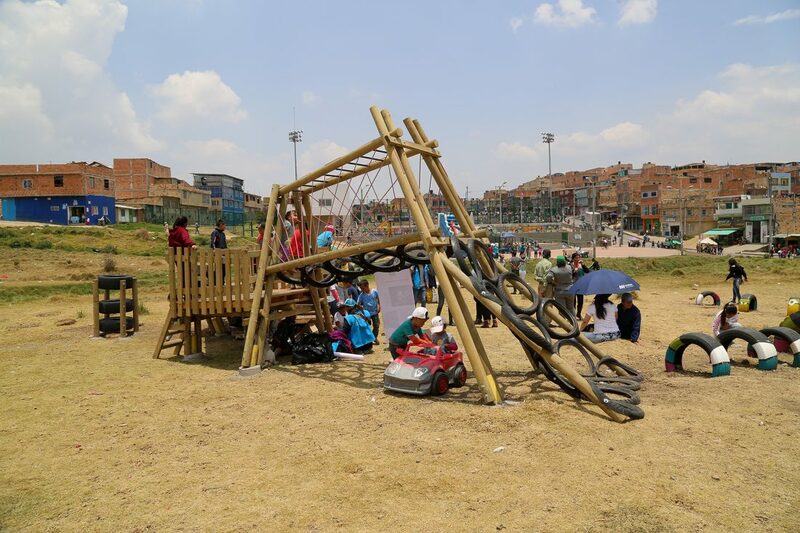 AT: So actually the project with the kids started this year after the city hall of Bogota commissioned me to on two large-scale projects in two local spaces that are both low income and have a lot of social problems. Both were urban slums. 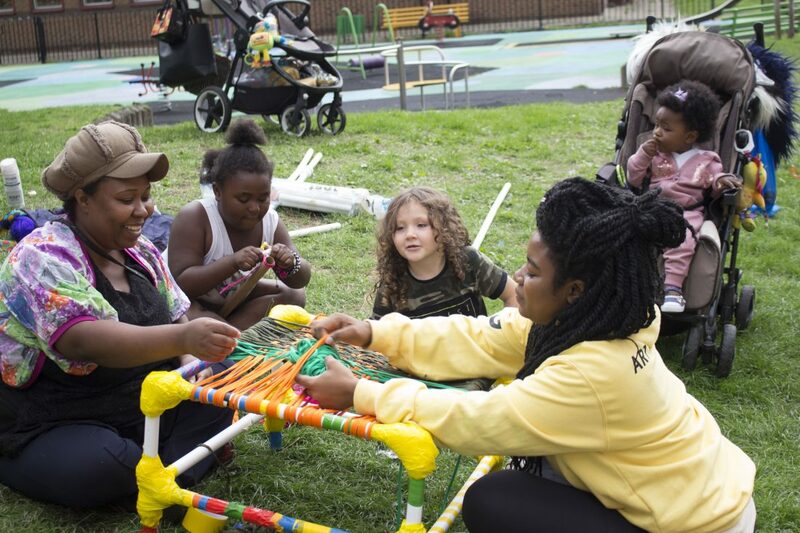 The beautiful thing about ‘Emotional Architecture’ is that when you enter a new space, you first need to look for the need in the community and that always involves making something shared for everybody. In this case, the focus for the community was the kids, immediately. It was in that moment that I started to think again about the idea that as children we have this need to build things like forts and shelters. I was commissioned to build something permanent, so in Cable Ciudad Bolívar I designed a new playground in collaboration with kids and adults. 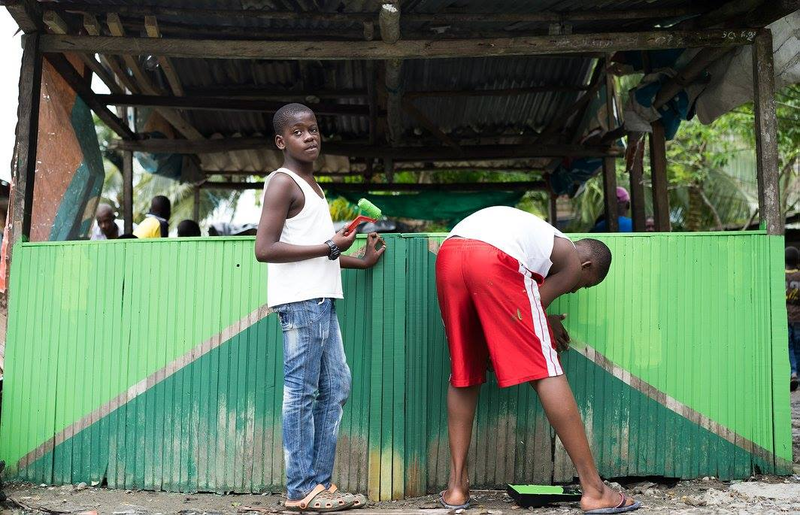 It was built by two carpenters and some individuals from the community and the kids helped to paint. And in Alto Fucha, we made a structure in response to the fact the outdoor spaces were too dangerous for children to play in. 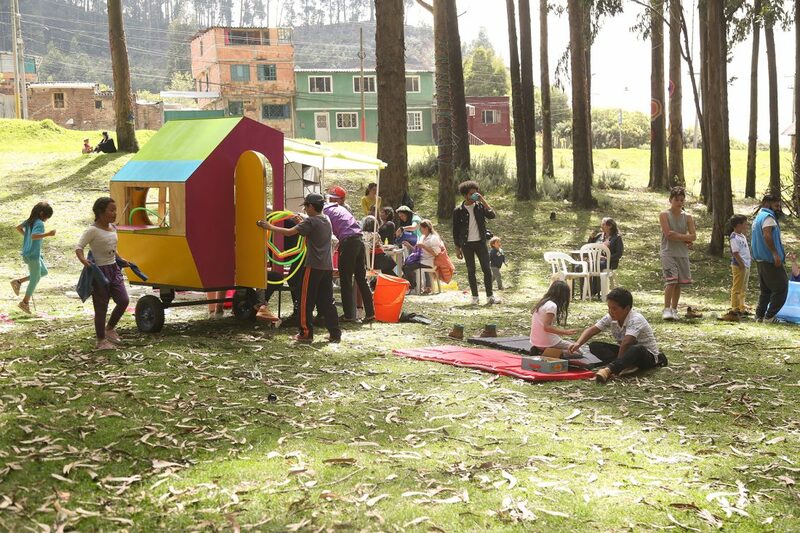 It is a wagon full of pedagogical toys for the seven intersecting neighbourhoods and it can travel around providing free rentals so that kids can play safely. In both cases, I was able to pay the skilled labourers and for the others helping out, I was able to pay them with materials they needed for their houses. SL: Is the wagon still functioning? AT: Yes, it is still functioning because there are these groups ran by young people that are really committed to the neighbourhoods and they are in charge of the wagon nowadays. AT: Then after that I worked in Medellin with the Museum of Modern Art. They have a programme for kids, so after seeing my work in Bogota, they asked to work with me. In this case, the budget wasn’t quite the same, so it needed to be something more temporary than before. But I liked that because in the end, ‘Emotional Architecture’ doesn’t have a concrete method and instead responds to the perimeters of the situation. 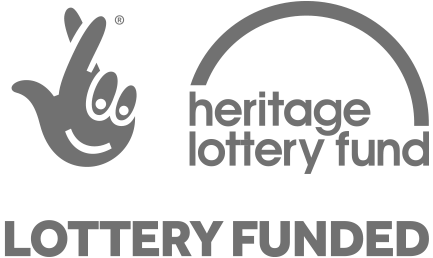 It responds to the communities needs, it responds to the budget and it responds to the programme I get invited to. So it’s very flexible in that way and because of that, it is better to have core values as opposed to a rigid plan. In Medellin there were three Comunas – very similar to favelas in Rio. So I went up into the mountains where there are some foundations that run activities for kids but instead of just running workshops, it was important for me to also create something that the kids could have after. So this is when I came up with the idea of working with tents and blanket forts. I delivered workshops about building these kinds of shelters and designed a structure made out of plumbing pipes that is made in a way that’s easy for kids to assemble and disassemble. 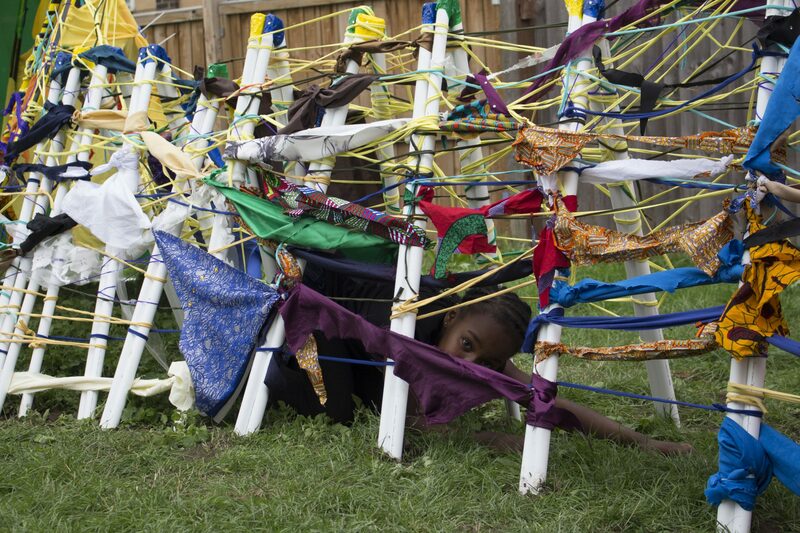 The structure was then covered with fabric that they decorated for two weeks. In fact, what I am doing here at SLG is an extension of what I did in Medellin but just in a different way. SL: So the decorating was to sort of personalise the structure? AT: Yeah, to customise and for them to feel as those it is theirs. SL: And provide them with a sense of ownership over the work? AT: Exactly, so they can have it in the foundation and use it whenever they like without having to ask for help from an adult. So they can assemble, play with it and put it back. So a whole workshop would be about decorating, another learning to assemble and another to learn how to disassemble. Day by day, every kid learned this process. We even did competitions until they really understood, as well as that it was for every kid in the Comuna. Even if it’s a new kid, they will teach them. So it’s a way of learning. SL: We have talked before about this tension between or notion of what is art and what is social practice but what I personally really like and believe is really progressive for the project is the lack of egotism coming from you as the practitioner. It’s like, yes you set a series of things up and you are responding to what the community asks for or what the host institution believes is what the community needs through their preexisting relationships with a community but what I really like is that you then let go of the project. For example, when I spoke the other day about ‘Angélica’s den… Angélica’s structure’, you replied ‘but it’s not mine anymore’. It becomes theirs. It goes back to this notion of it being a shared entity because it is a product of the communities’ shared labour. It’s not that they are producing the work for you. 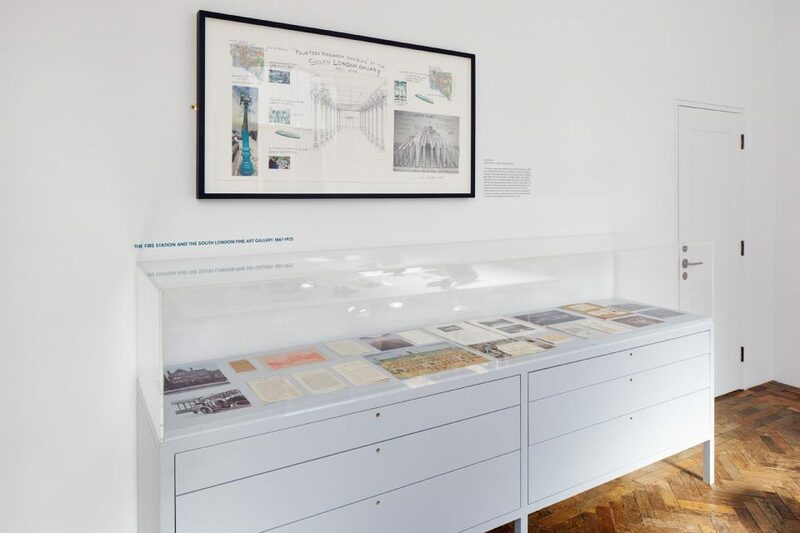 It seems as though that understanding is really important for you and I suppose I’m wondering then, if you could tell me about when ‘Emotional Architecture’ is in a gallery context and not necessarily an aesthetic or structural result of working with a community. AT: Yeah but at the same time, when I work in galleries and I build these temporary structures, in the end, it is again not about me. I like these structures because for me it is another way of producing art that is very physical. You have to climb, you have to go in to experience it. Sometimes there is nothing in the space. It is not like you’re climbing into a treehouse to check out some paintings or music, as most often there is nothing in the space. So what you have to do is just hang out with the people…the random people that climbed the same treehouse as you! AT: Yeah and I think often people assume that you build a space in order to display something. People sometimes say ’where is the artwork’ and I say the artwork is this: hanging out with the random person that’s also around, checking the space through another perspective, looking at the way it is constructed, thinking about how this treehouse came here and why. SL: Yes, it can tap into peoples imaginations and perhaps maybe that goes back to the importance of fiction in your practice? AT: Yes and sometimes you might see one or two videos around that might also enhance the space. Or visiting alone, it could provide a space for reflection. You know how I like to think? I used to study Buddhism and I like to listen to the Nuns more than the Monks in my practice. There was one woman who said the world is between two energies, feminine energy and masculine energy but that doesn’t necessarily relate to men or women. It is just an energy that we all have. The problem is that the world is using a lot more male energy, so there is this imbalance going on. Masculine energy is action and feminine energy is to provide space and I like to think about it because I think in the case of art, we are using a lot of masculine energy. I’m not talking about feminism or that there are more male artists…it is more that art is always about action. You produce this, you show this, you do this but there is not so much art that is about providing a space for other people to actually do the action. So I feel like my installations are a way of using more feminine energy to experience art in a different way. I provide the space but I do not make the actions of the space. That is how I like to think about it. It is not about me…I mean, yes, my name is always there but it is just a label that will help to produce more spaces like this. 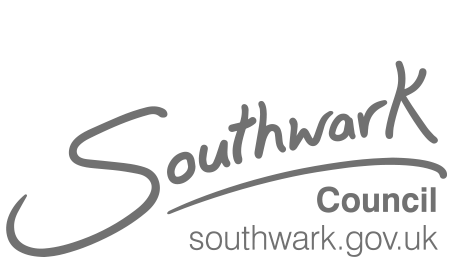 SL: Now I would like to talk a little bit about your experiences of working with the South London Gallery and on Pelican Estate, your working process and the importance of the structure remaining on the playground for the duration of the project. AT: I really enjoyed when the South London Gallery invited me because it came completely out of nowhere! I was very surprised how they had noticed my practice in Colombia and what I was doing with communities. I’ve been conscious of putting everything online because I think it is important that other people can see the work, as I imagine a lot of the time people wonder how you can work with communities like this and I think this approach is actually a very good way to do it. You provide the skills but you are not the coloniser. This opportunity has also provided me with the space to work on ‘Emotional Architecture’ in a context outside of Colombia. So, even if there are similarities in the issues that effect the communities it has provided a new set of conditions to respond to. It has been an important step for the project to travel. So my new conditions at South London Gallery were: I am here for the month of August, I work two days per week with the kids and I have this amount of budget and it will be something temporary and so based on that I had to decide what to do. I had just finished my project with the kids in Medellin in the Comunas, as well as up in the mountains where I had gotten really into this way of making structures out of plumbing pipes. I think it’s really good for the kids because I prefabricate things for them and they can just play almost like constructing with lego. So thinking about that and knowing I will have a whole month with the kids on Pelican, I thought with the pipe structures they can make whatever shape they feel like…the possibilities are infinitive! It just depends on how much material we have, as well as other recycled materials. Oh and the other condition was that it would be outdoors, which I thought was really cool as it’s summer. Well, it’s raining but it’s summer. SL: You arrived just as the heatwave finished! AT: So you have to think of materials that can survive outdoors and use things suitable for camping such as tarps and plastics but you can also work with indoor things such as netting and fabric. I have also been using a new material that I have been working with a lot, t-shirt yarn because it’s very economic, colourful and kids really like it. SL: Yes, its really versatile. It can be used in lots of different ways. For decoration, for structure or adding strength. AT: Another material that I find the kids are really good at using are cable ties. They really like it. And tape! That has been our saviour in a lot of situations. SL: But it’s interesting how along the way you are beginning to learn which materials work best with the kids we are interacting with as opposed to other situations. AT: Yes. I also didn’t know the conditions of the neighbourhood as I am not from here but as it’s summertime I thought it was interesting to create something that grows little by little until the end of the school holidays. I think it’s important for the kids to see it growing and understand they can build their own space. But also, it’s important for the community around to see it, so we have been making signs so they know what is going on and also to test the boundaries of the space. I remember the first day when we put up the very little tent. It was raining and because of this only one of the kids really survived through the storm! We were initially a little afraid of what might happen to the tent but as the days went on, we discovered that the things we thought might happen to the structure, didn’t. I am really happy that every time I visit the playground, while there is some damage there, it is not through vandalism but through play. So every time the kids visit and the structure is still there, they feel more engaged to keep working with the project. SL: Yeah, I mean we’ve had children saying things like ‘I’ll make sure nothing happens to it, I’ll sleep in it, I’ll do this, I’ll do that’ and they’re gaining, as you’ve mentioned before, this sense of ownership. This sense of pride and care for this den or structure And yes, they’ve absolutely been playing in it when we’re not there! So it has this ‘life’ outside of workshop hours. AT: In a way, it’s also acts as a kind of resistance in the sense that we can work as a clan. The kids are protecting it themselves and learning that they shouldn’t be scared of their own space outdoors. They are learning that this space is theirs and also, perhaps people that might have vandalised it begin to respect that, too. SL: As you’ve been working on the project for some time now, I was interested in whether you see a natural end to ‘Emotional Architecture’ or whether there is a methodology that could be taken forward by other people or how it might play a part in the future of your practice long term? AT: I mean, it’s not the only thing I am doing. I have other projects but I think this one is hard to end specifically because it has so many possibilities. For example, I don’t want to end my work with communities as a lot of things could happen out of those experiences. It can grow and grow. In general, I view my projects as part of a big tree with different branches. So sometimes they pause but I can always go back. Angélica Teuta would like to thank Leona and Harry, Jasmine and Zantha, Lola, Patricia, Grace, Ruadhan and Caoimhe, Lola and Morvin, The Art & Play Team, as well as the many other children and residents from Pelican Estate that contributed towards the building on Pelican Playground during August 2018.